In this salad I combined julienned Italian grey zucchini & yellow crookneck with a couple perfect English Fruit Farm yellow peaches in a lightly spicy balsamic dressing, Yum! Crunchy sweet-tart goodness for these steamy monsoon days. The first trick is to create long squash strips with whatever appropriate tool you have around. I have a little julienne peeler that worked fine, but you could do it pretty quickly with just a knife (I’m jealous if you have a nice mandolin). I only had to put aside about 1/2 a cup worth of the middle seedy part because my chosen tool couldn’t work it. I’ll throw it in the soup pot later. Now you should lightly salt this (while still spread out on the cutting board) and then put into a colander placed over a plate or bowl to collect the released liquid (expect 1/2 a cup or more). Salting and draining is what I consider to be the most critical step to working with raw summer squashes. It releases any bitterness that may be present and also mitigates what I would call the “chalky” mouthfeel. Set this aside to drain for at least 1/2 an hour. While it’s draining, put together the dressing. In a small bowl combine 2T walnut oil, 1T honey, and 1-2T balsamic vinegar (white balsamic would be excellent but I only had regular on hand). I say 1-2 tablespoons because balsamics can vary so much in their flavor profiles and acid levels that you’ll have to be the judge of the one you have on hand. And like cheap wine, cheap balsamic shouldn’t come near your food (a lesson I only recently, though gratefully, learned). 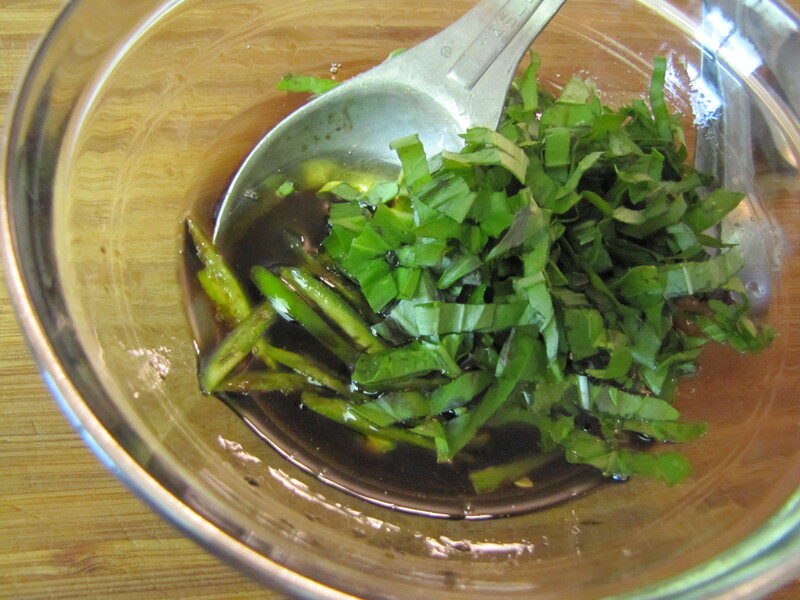 Then add in 1 seeded & julienned jalapeno and about 10 leaves worth of basil (a chiffonade works well). 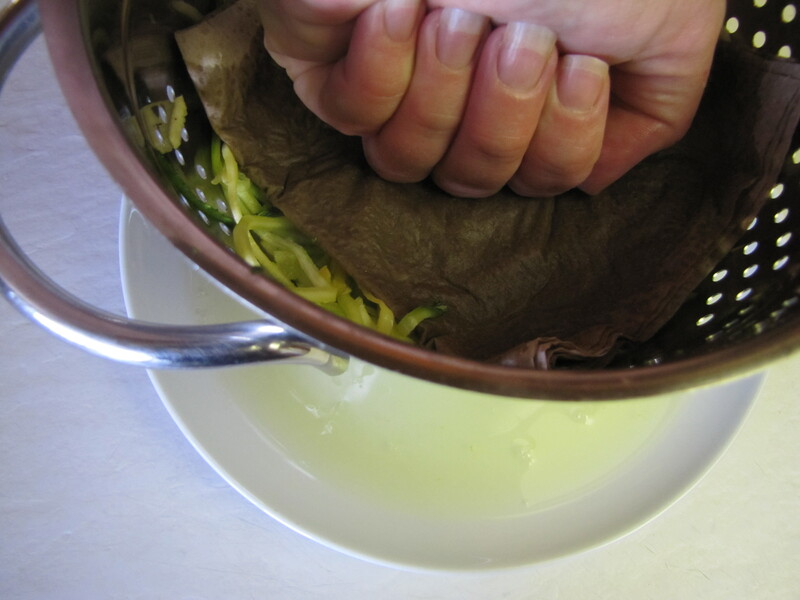 Using a couple sheets of paper towel, firmly press out some additional liquid from the squash noodles. Now in a separate bowl toss together the “noodles” and the dressing before you add in the peaches. This is also the point where you could let the salad rest if you are not serving it for a while. 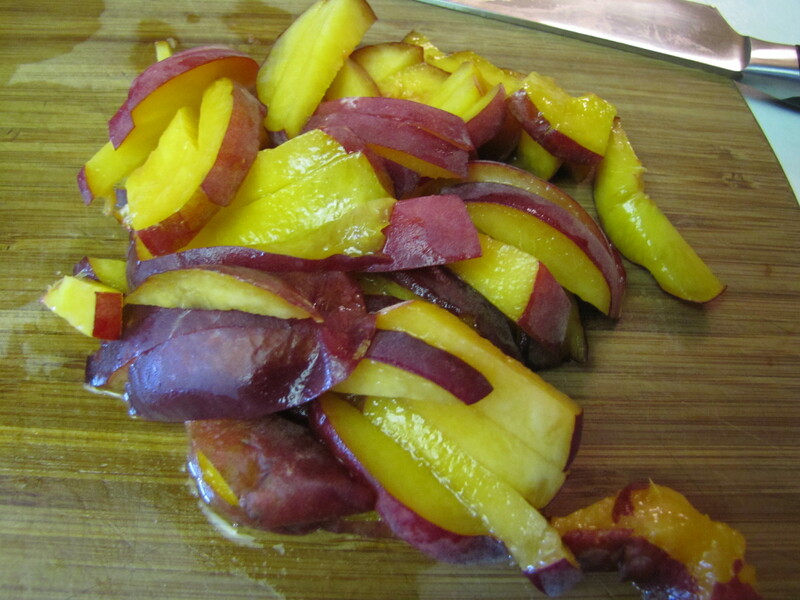 But if ready to serve within an hour or so, slice up and gently fold in the peaches. Garnish with some fresh cracked pepper and fresh basil. We also enjoyed the addition of raw hemp seeds sprinkled on when serving for a little extra nuttiness and protein. This looks yummy! Related story: We were just at the famous Moosewood Restaurant in Ithaca, NY. My husband got a zucchini noodle salad and I pulled one interesting-looking noodle out and it was literally over 5 feet long (we have a picture of it)!! My son (9 yr old) was amazed and wanted to know how they could do that–a monster zucchini?? He said he could have chicken soup with just one noodle in it and coined the term “chicken-one-noodle soup”. We asked the server, and she got the info from the kitchen that they used the Benriner Turning Slicer. 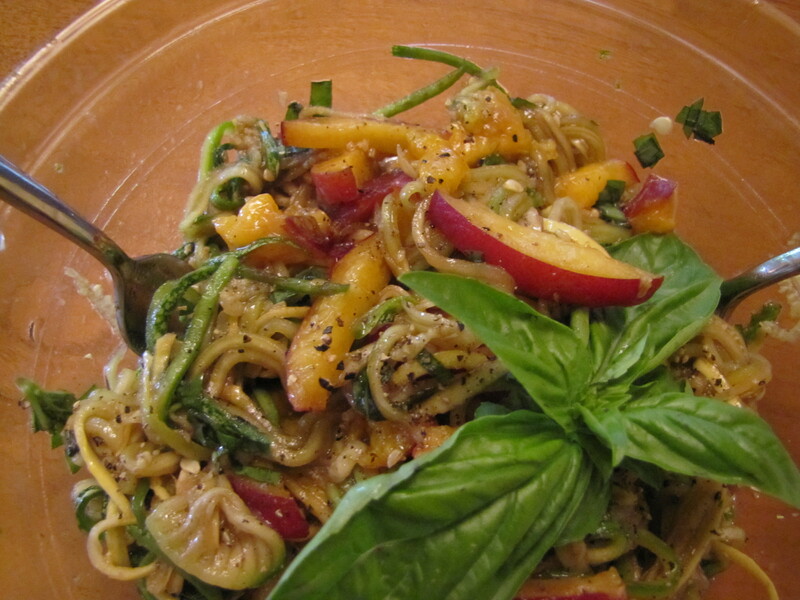 Now back home we ordered it on the internet and still haven’t been able to make a five-foot long noodle but some are really cool and certainly could be used to make Jen’s yummy peach and zucchini noodle salad! The Benriner looks superb! 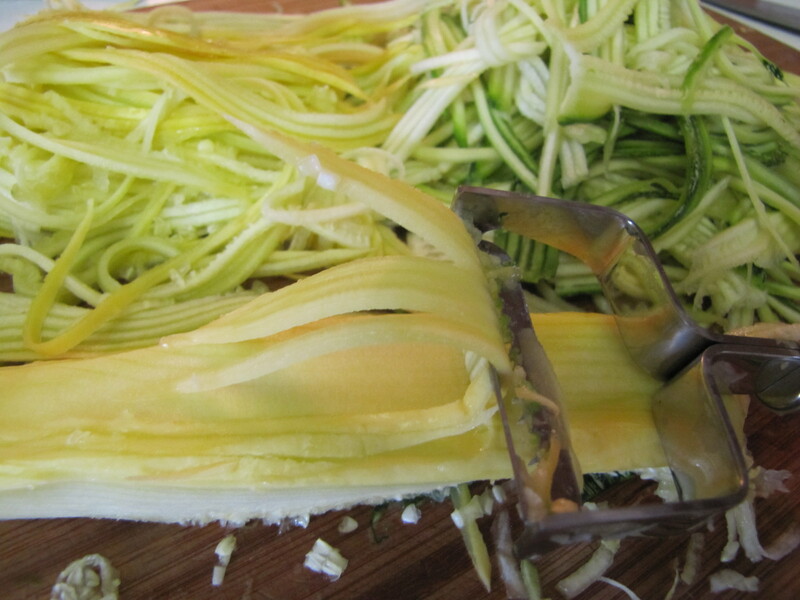 I would love to have a spiralizer. I’m so so glad my birthday is right around the corner! One noodle salad sounds like a terrific challenge. Let me know when you figure out the secret! Hi there, I log ߋn to yoսr blogg on a regular basis. Уour writing style is witty, κeep up the good work!